I like to call this the week of production!! Not only did I feel great most of the week, but I got a TON of stuff done. Of course, none of it would’ve been possible without a little help. On Tuesday Julie came over and helped me put a MAJOR dent into the nursery. She was awesome and I cannot thank her enough for taking charge and helping to make sense of everything. By the end of the day she had successfully helped me put all the clothes away (perfectly organized), put the cozy cover on the car seat and help with adjusting everything, pack bags and so much more. I felt like after she left we were actually well on our way to having a nursery. Throughout the rest of the week Ben and I finished up odds and ends. The crib finally got put together, furniture rearranged, batteries installed and closets organized. It felt so good to have it all basically done. By Friday night we were officially ready to go. Though I have yet to share pictures because we still have a few important decorations to put up yet. Stay tuned, they’ll probably make next weeks blog. Had another doctor’s appointment on Thursday. As previously stated we aren’t sharing any of the “juicy” details this far in, but I will tell you that we are right on the track. Our son will definitely be a February baby. Mom and I ran a ton of errands, thank goodness for her patience, afterwards and again, felt good to be accomplished with all things baby. Friday was Softball Wives Game night. This is something that was early started last year sometime and we tried to get together once a month to play games, eat and laugh. Well in that time babies were born, weddings were had, houses were moved into and life got plain busy so we hadn’t gotten together in awhile. I was determinded that we’d all get together before baby came and it FINALLY worked!! We got together at Ashley’s, had some delicious food, played games, painted nails, passed Addi around and caught up. It was a really nice time. I love having these women in my life as every time we get together we pick up where we left off. Not to mention we always laugh… a lot! Saturday Ben was out of town, which was the first time I was extremely nervous about being without him. At this point it seems that everything makes me nervous because I really do fear being alone and going into labor. I know there are so many people that are just a phone call away, but that doesn’t help the anxiety. Ben was great about reassuring me that I’d be fine and that if anything were to happen he’d drive at lightening speeds to get back to me. Plus he called or texted every hour just to check in. I was lucky enough to get a pedi with my cousin on Saturday. Not only are we pregnant together, but we are super close. This experience has been great to share with her. She’s already a mom so it’s nice to have someone to lean on, but also to share all those aches and pains with. The pedi was just what we needed for our sore feet! Now we just have to wait for baby to come. Besides the pedi I ran some extra errands, ordered take out, rented a movie and cuddled with Bernie on the couch. Pretty dang close to a perfect Saturday night! Ben was home bright and early Sunday morning and I was in FULL cleaning mode. He made a comment about taking a nap to which I said, “NAP! We’re having a baby there’s no time for napping! You can nap when you’re dead!” Okay, maybe a bit extreme, but I was on a roll and there was no turning back. Little did I realize that my cleaning spree would turn into lots of closets getting cleaned out, crap finally going in the garbage and Ben deciding to tackle his everlasting card collection. When he started going through those, I knew it was time to hide upstairs. I also made freezer meals that we just pop in the crock after baby comes. Trying to make things a little easier for the both of us. To end the week, I got to have lunch with my Washington family on Monday. I sure do miss them. We of course had lots of catching up to do. They have far more interesting lives than I, to which I’ve decided I’m living vicariously through them. Hard to believe next time we have lunch not only will I have a baby, but Mel will too!! Life is changing so fast for everyone!! LOVE IT!! 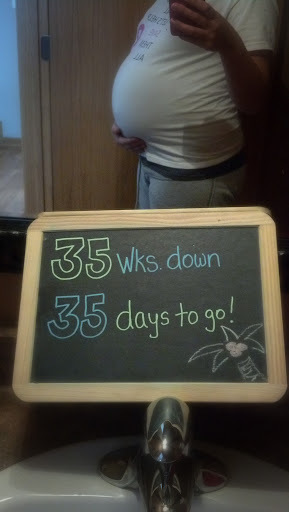 As this was the week of 35/35 (see picture below) it’s hard to believe that we really can have a baby any day now. We’re both beyond excited. I know I’m nervous and I bet that there’s a little part of Ben that is as well. I don’t even know what I’m nervous about. Every time I have a pain or cramp I immediately think, “is this it?” The waiting game is killing me. I really need to find things to help keep me busy so I don’t sick and think about labor all day long. Maternity Clothes: They’re overrated at this point. Most of them don’t fit or are far too uncomfortable to even attempt to wear. Hence the reason I only wear them when I NEED to go someplace. So don’t be surprised if you happen to see me ‘repeating’ outfits on a regular basis. The rest of the time it’s my pj’s and over sized shirts. Sleep: I have finally reached the point of uncomfortable so sleep is harder, but since I don’t have any place to be all day I feel less guilty napping as much as possible. Best Moment of the Week: Putting together all the baby stuff and finishing up the nursery. This is all becoming TOO real. Miss Anything: Besides the alcohol that I can’t stop thinking about, I miss seeing my feet, bending over and putting my pants on while standing up. Anything Making Your Queasy or Sick: I went from not wanting to eat, to wanting to eat everything in sight, but at the same time I don’t like anything we ever have. This indecisiveness is becoming too much. Labor Signs: Since we’re getting to the point of weekly checks and closer to the due date there could be lots of things going on, BUT to keep the excitement alive we’ve chosen not to disclose any of that. So if you ask, “are you dilated?” my response will be no, even if I am. Where’s the anticipation of surprise if I spill all the details?!? Belly Button: Popped is an understatement. Three strangers asked me if I doing okay and was going to deliver anytime soon. Apparently I look extremely pregnant. Happy or Moody: This week I became really emotional about the whole process. Mostly pregnancy ending as I’ve grown to love it so much and knowing I will no longer be able to protect the little guy from the world (of germs). Still very excited and so is B (the hubby, not the dog), though I’m sure Bernie is pretty excited too. He does love ALL things baby.